Animation made from seven LROC images of the Apollo 14 landing site, ordered from sunrise to sunset. LROC images courtesy NASA/GSFC/Arizona State University. An object north of the LM casts a faint shadow, probably the large, umbrella shaped S-Band antenna. There is also a shadow that appears to be cast by the Modular Equipment Transporter (MET). 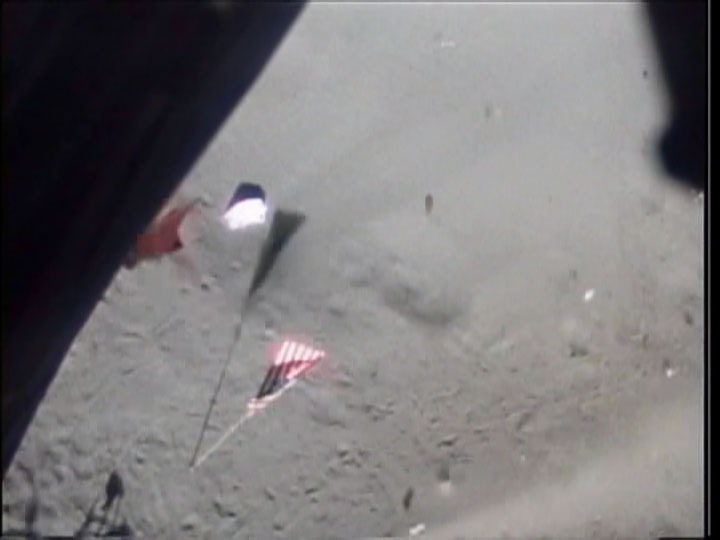 The flag was deployed closer to the LM east-west center line than the S-band and, after liftoff, ended up pointing in a northwesterly direction. There is no unambiguous evidence of a flag shadow in the LROC images. 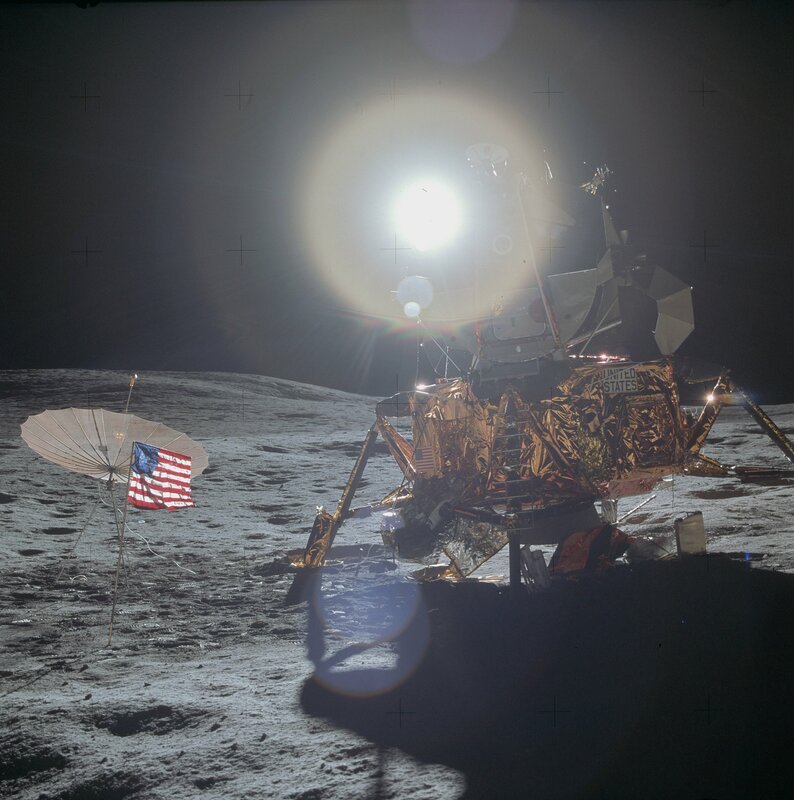 The Apollo 14 landing occurred on Febrary 5, 1971, with the crew spending 33.5 hours on the lunar surface before returning to lunar orbit. 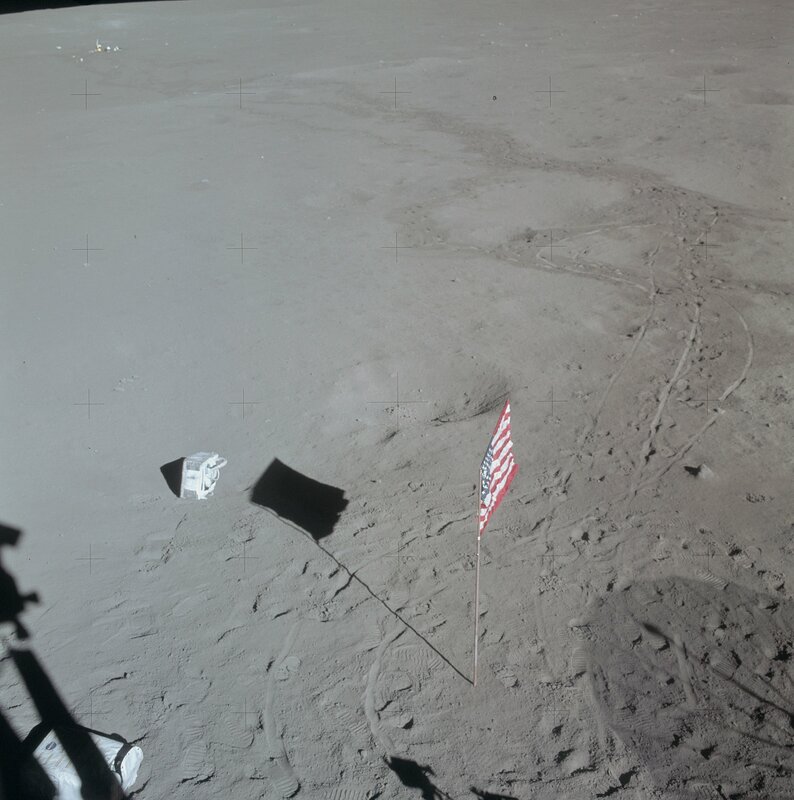 Al Shepard and Ed Mitchell deployed the flag early in the first EVA, with Mitchell hammering the lower section of the pole into the ground. Detail from AS14-68-9486, showing the LM from Station H late in EVA-2. 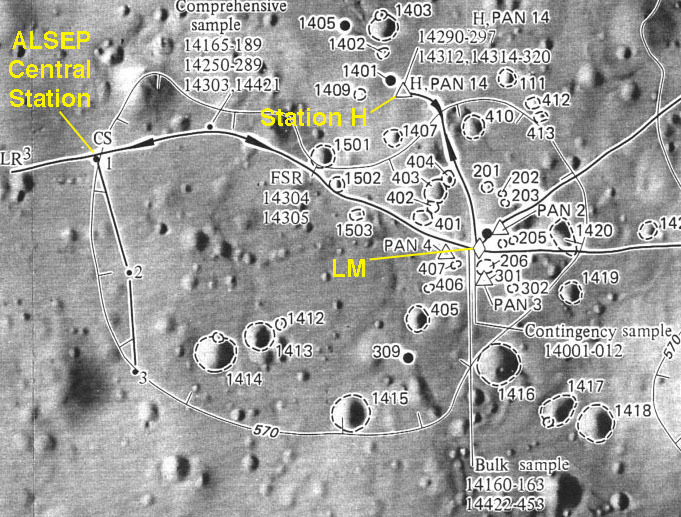 Station H is about 26 degrees west of north, giving a view of the hatch and ladder. The flagpole is on the same line-of-sight as the center of the forward footpad, indicating that the flag farther west than the footpad. Consequently, at liftoff the engine exhaust will swing the flag around to point west of north. Change in flag orientation from before (left and center) and after (right) the RCS hot-fire check. The image of the left is Hasselblad image AS14-66-9338. The center image shows the same flag configuration was seen by the 16-mm DAC mounted high in the LMP's window. The image on the right is a DAC frame taken after the hot-fire check. Clearly, the flag swung primarily under the influence of the thrusters just to the left of the LMP window. Composite by Journal Contributor Yuri Krasilnikov. Note that, in the DAC image taken after the hot-fire check (right in the previous figure), the S-band shadow is missing. Having passed you the changes through the comm configuration at minus 1 hour and 15 minutes, we'd like to hold off on going into the Down-Voice Backup mode and ICS/PTT until lift-off minus five-zero minutes. 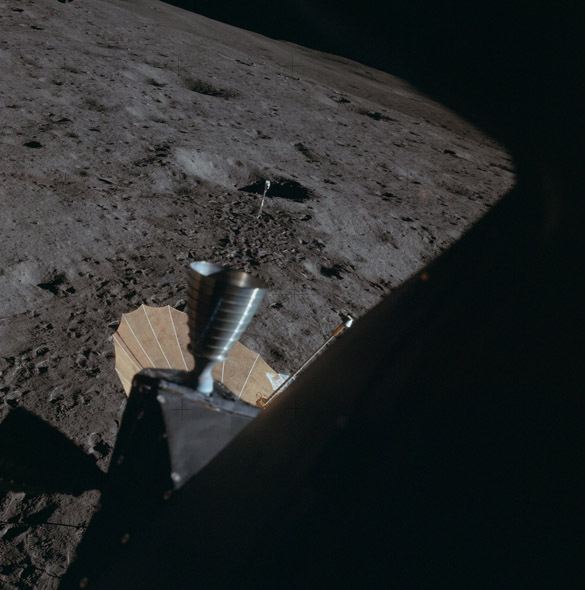 That is, just prior to the RCS hot-fire check, as we're advised that on Apollo 12, the hot-fire check blew the erectable antenna over. If the erectable antenna is still standing after the hot-fire check, we'd prefer to come back into the Normal voice configuration until sometime shortly before lift-off. Over. Okay. Here we go. (Long pause of about one minute) Okay, Houston. The (S-band) antenna blew over. 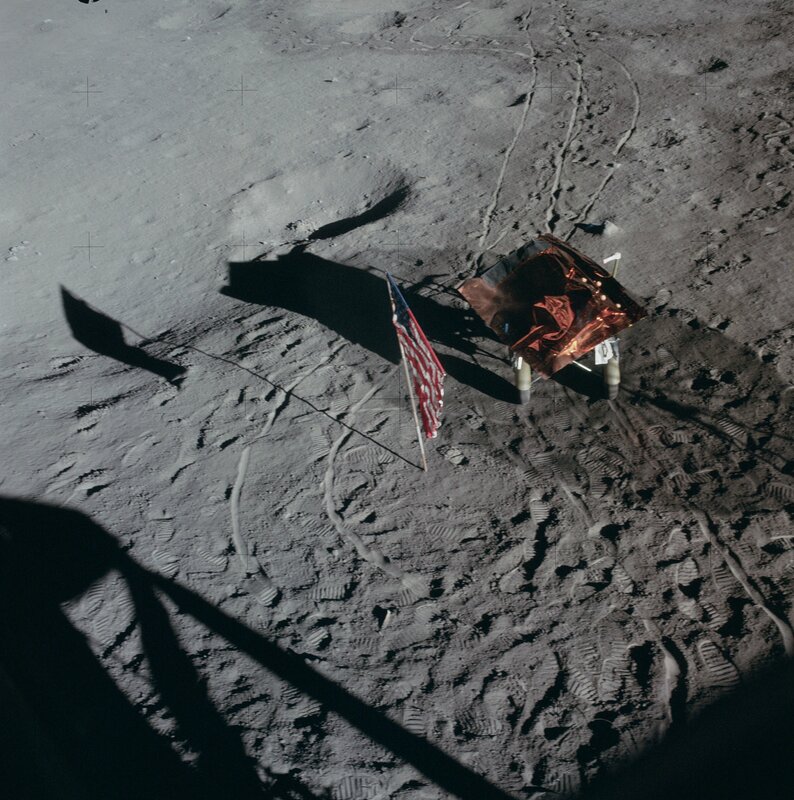 As can be seen in Apollo 11 training photo S69-31059, the tripod and transmitter mast were firmly connected to the dish. A film clip shot during Apollo 14 training by Ed Dempsey show how dramatically the dish sprung open, a good reason for solid construction. 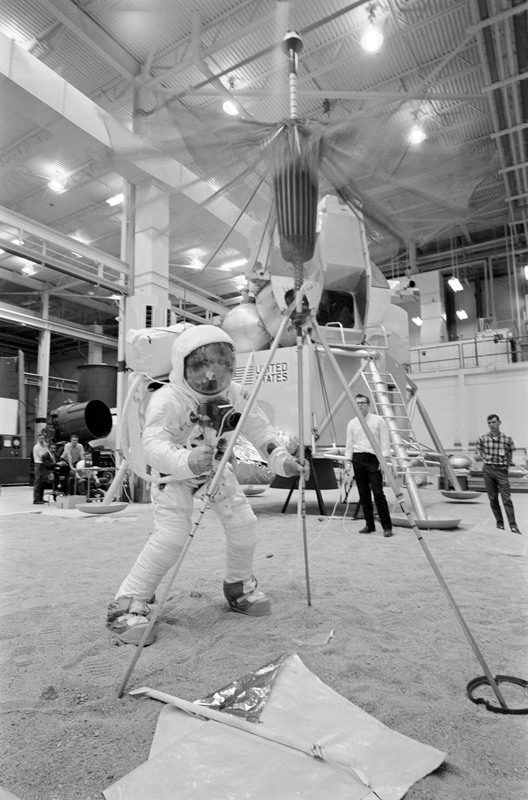 During training, the astronauts quickly learned that they had to take firm hold of one of the tripod legs to keep the antenna from tipping over. 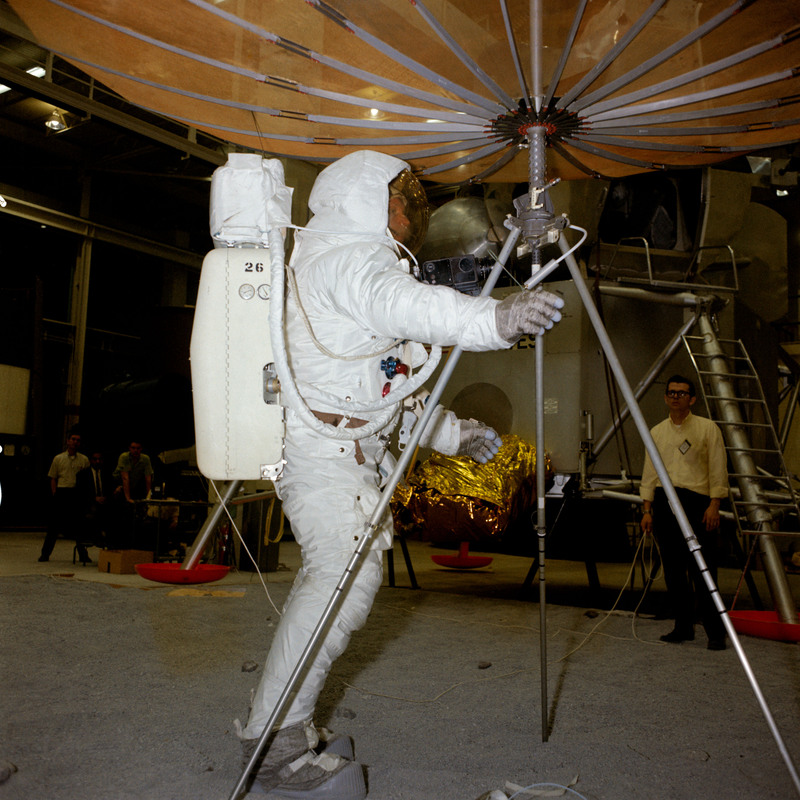 Apollo 11 training photo S69-31162 shows Armstrong hold a tripod leg while the dish springs open. The flag was in the field-of-view of the DAC camera for the first three seconds of the ascent. The flag was still waving under the influence of the ascent engine exhaust when it went out of the DAC frame, but was generally pointing northwest, as would be expected for its location northwest of the spacecraft. Frame grab by Ken Glover. With the S-band antenna having blown over during the hot-fire check, it undoubtedly flapped around during liftoff if it remained connected by cable to the MESA. The other object near the LM that is likely to cast a noticeable shadow is the MET. As can be seen in the DAC frames, the MET is parked closer to the LM E-W centerline than the flag. The distinguishing feature of the MET is its bulk and low profile. 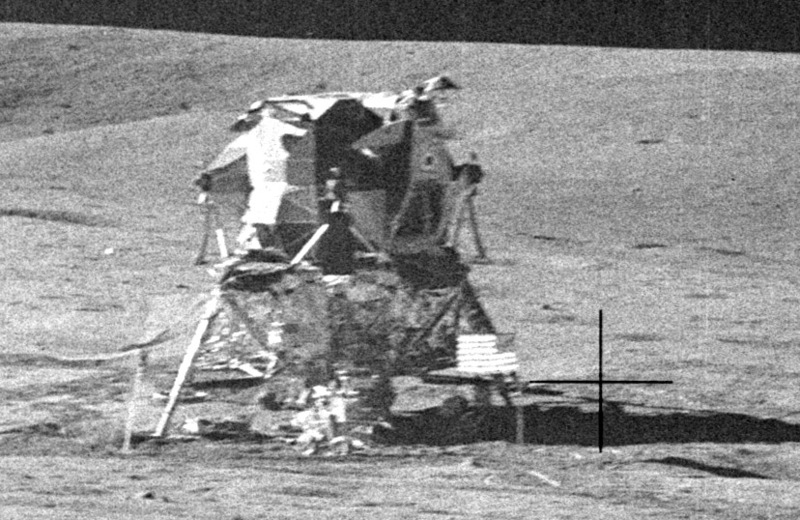 In the following comparison of LROC frames, there is a shadow casting object at about the right place, and with a shadow that remains attached to it. 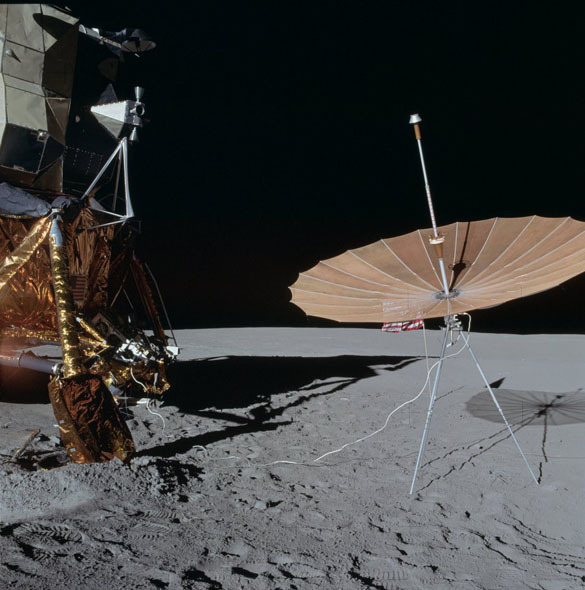 Note that the presumed S-band shadow is much narrower than its Apollo 12 counterpart. In addition, we don't see a clear indication of any part of the dish showing up in reflected sunlight. This suggests that the antenna may have ended up on its side, with the tripod and transmitter mast aligned north-south.